But things become knotty when local troublemaker Cornell Lewis is found dead with a plate of Snickerdoodles from the bake sale. Two members of the Silver Six are accused of cooking up a murder plot, but Nixy knows that the cookies weren’t literally to die for. With time running out, Nixy and company must catch the actual killer...before the Silver Six find their number permanently reduced to four. I’m a huge fan of Nancy Haddock’s Silver Six Crafting Mystery series. 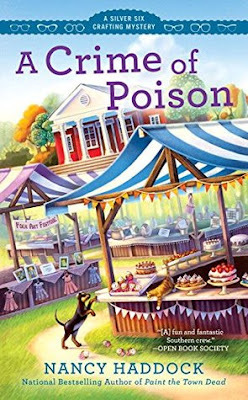 “The Silver Six are always entertaining.” A Crime of Poison details how the group of over 65-year-olds came together and shows just how dedicated and protective they are of each other. Before the Silver Six all moved in to Sherry’s farmhouse, they all had their own homes or apartments. Maise, Aster, and Eleanor all lived in the same cheap, rundown apartment complex managed by Cornell Lewis. Cornell was a lot of things however, caring and nice would never describe him. He’s now returned to Lilyvale to work at the Fall Folk Art Festival and to also apologize and make amends for his past horrible behavior. Not only did Cornell wrong Maise and Aster, he mistreated a majority of the residents at Ozark Arms. Once Nixy starts to investigate the life of Cornell, she’s disgusted by all the things he has done in the past. She finds a whole list of people wronged and no one caring about his death. The suspect list is a mile long and she’s running out of time. The Silver Six zero in on a surprising person and concoct a scheme to bring them down. “I do believe you’d best give in Nixy.” Young and old go head to head in a battle of wits. Nixy and “Fix It” Fred are put in a life threatening situation. I love this series because the characters are simply amazing. The Silver Six may be senior citizens, but they are fun and full of life. They definitely keep Nixy on her toes. And speaking of Nixy...I love the blossoming romance between her and Detective Eric Shoar. A Crime of Poison is definitely a standalone read. It’s the third book in the series and potentially the final book. I hope that it isn’t. But if it is, Nancy ended the series perfectly. Wow, Kim! Thank you for the amazing review! I'm tickled you love the characters, and I hope to keep writing them one way or another! Stay safe and well and have a happy holiday weekend! You're welcome. I hope you do get the opportunity to write more of these books.